One thing that inevitably happens in a breakup is that you lose some friends. They become his friends and her friends. 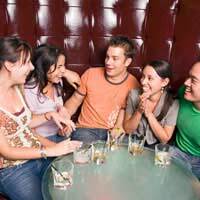 While those who stick with you form a core group you can rely on, there’s no doubt that you’ll need to widen your social circle once you’re single again. That doesn’t mean for dating. Companionship can be its own reward, spending time with people of both sexes whose company you enjoy. It takes you out of the house to do things you enjoy. For many people the pub is more than just a place to get a drink. It’s a social centre where you meet friends as well as those you barely know. It may be that you have to move and what was your local is no longer close. But if you like the atmosphere of a pub, find one close to you that suits you needs. After a few visits you’ll come to know some of the locals and even find a group to sit and talk with. Of course, the pub is a British institution. But it doesn’t always feel welcoming to single women. What are the options for them? There are nights out with the girls, of course, whether to a bar, or a movie or whatever. They can be fun, but most wouldn’t want to do them all the time. Joining a group or club can be a good way to get out and with people – and it works for men, too. It’s non-threatening, and if you pick something that revolves around one of your interests, it also helps you develop that into something bigger that can occupy more of your time. Another thing that might help women is by becoming a rep for a company like Avon. It can bring in a little extra money, but you also end up knowing a lot more people through the parties that are organised. Joining a club or group is a great option for men, too. The interests will probably be different, of course, but these days there are clubs for just about anything. Sports might well figure large for males, and sports clubs, and clubs for all kinds of sports, can be found all over the country (playing a sport is a good way to be healthy, too). Why Do We Need Social Circles? There are a few introverts who manage very well all alone or with just one or two close friends. Most of us are more social creatures, however, and with a number of different interests. Different social circles allow us to enjoy all those facets of ourselves, to feel fuller and more rounded. It’s mentally healthy to be around people, to interact and enjoy company, and to mix and mingle outside your own home. It focuses your thoughts outwards. More than that, it gives you the opportunity to indulge your interests, whatever they might be, and find like-minded people of both sexes. There’s no pressure in most social interaction, just the chance to talk and relax – and both are important, especially if you’re not talking about yourself and your own problems. Those need to be addressed, but you also need time away from them. The greater your social circles, the more your opportunities to enjoy yourself, to make friends, and become comfortable with yourself and your new life.